Max Eden may be one of the only education reporters left, and he isn’t even a reporter. His article in The 74 today describing how changes in discipline policy led to the severe deterioration of behavior in a New York City school may be one of the best pieces of education journalism I have read in many years. It is thoroughly documented, clearly described, and conveys a compelling and alarming story about how discipline reform may go awry. To be clear, Max does not prove in this piece that discipline reform necessarily or even typically leads to these problems. But that is not what journalism does. Reporting raises issues that social science can then examine using its approach to adjudicate whether these patterns are causal and systematic. The problem is that too many people seem to confuse journalism and social science and think that only the later should exist. I came to this realization as I was wondering why I so rarely come across the kind of quality journalism contained in Max’s piece. What are education reporters doing instead? First, we unfortunately have far fewer education journalists than we used to. Education is mostly a local story and local newspapers and their ranks of education reporters have been decimated by the rise of internet news over the last two decades. Second, the national and often foundation-subsidized outlets we have left are often focused on advancing various agendas, whether reform-oriented or partisan, and seem to have little interest in the type of in-depth reporting contained in Max’s piece. Third, and perhaps most alarming, is that there is a new type of education journalist who imagines him or herself as a mini-social scientist who adjudicates for us what “the research says.” Despite having no social science training or experience conducting research, this new breed of education journalist holds forth on what the correct interpretation of the social science evidence is. Often they do this on Twitter, which has a short format that does not allow for in-depth discussion. Anyone can sound like an expert in a few hundred characters. But the truth is that there is usually no simple narrative about what social science has to say and reporters are very poorly positioned to adjudicate the truth about social science. In the past, reporters understood this and used to leave claims about what the evidence says to researchers. Reporters who covered research saw their role as quoting competing researchers so audiences could get some understanding of the issues in dispute. Not any more. Now this new breed of faux social scientist/reporter regularly holds forth on what the evidence tells us. And not surprisingly, the cool kid club of social scientists whose research is affirmed by this new breed of reporter has plenty of praise to heap upon the reporter for being so smart and wise as to say that the researcher is correct. These reporters and researchers have formed a mutual admiration society. Any criticism of either reporters or researchers in this tight circle is met with considerable outrage and re-iteration of praise for each other, typically on Twitter. If reporters are going to start masquerading as social scientists, I suppose it is only right that others should step in and start to play the role of journalists. The world doesn’t need (and is little influenced) by reporters pretending to be social scientists and adjudicating what the evidence says. 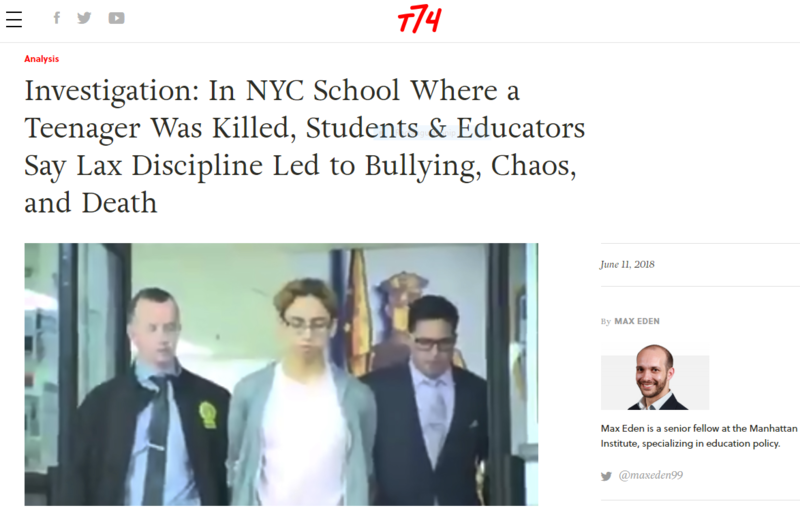 But the world does need and our research agenda will be influenced by the type of in-depth reporting that Max Eden has done in his new article on discipline in a New York City school. This entry was posted on Tuesday, June 12th, 2018 at 2:41 pm and is filed under Uncategorized. You can follow any responses to this entry through the RSS 2.0 feed. You can leave a response, or trackback from your own site. The clarity brevity of this post is awesome and excellent and encompasses a lot of critical crucial points. There are a few education writers around ( Jay Matthews, Valerie Strauss, Jimmy Kilpatrick ) but few have a grasp on the issues- and often few have a comprehensive grasp on the complexity as to what education has evolved into over the past fifty years. Excellent and insightful article.